You’d love to get more bone broth in your diet, but you’re just not quite sure how. Yes, you know you can sip it straight from the mug, and you still have your grandma’s chicken noodle soup recipe stored in the pantry. But you’ve been there, done that, and you’re craving something new. Something you’d never even think to make. Oh, we feel you. At Kettle & Fire, we’re constantly searching for new, exciting ways to get more bone broth in our diets. So to help you (and ourselves) out, we searched the internet for some fresh, inventive recipes. Keep reading for the latest ways to get more chicken bone broth in your diet. Many recipe developers and store-bought brands use the terms “chicken broth,” “chicken stock,” and “chicken bone broth” interchangeably. However, chicken broth is not chicken bone broth — homemade chicken stock is actually closer to bone broth than broth. Chicken bone broth must be simmered for 24 hours to extract the collagen and other beneficial nutrients. If you’re making homemade chicken broth, this recipe uses an Instant Pot, or pressure cooker, to shorten the process considerably. While there is a significant difference between chicken broth and chicken bone broth, the two ingredients can be used interchangeably in recipes. Therefore, if you see a recipe online you’re just dying to make, but it calls for chicken broth, simply substitute chicken bone broth. Let’s get to the recipes. You can use bone broth in salads, starters, and veggie side dishes to complement or kick off a meal. Note that soups are not looped into this category. If you’re following the keto diet or other low carb diet, you might be missing your favorite grains. But just as zucchini can be made into pasta, parsnips (shockingly) can be made into rice. In this risotto recipe, The Paleo Mom “riced” parsnips before combining bone broth (you can use beef or chicken) with coconut milk into one creamy dish. Quinoa is extremely versatile due to its rich, nutty flavor. For a grain, it’s actually packed with protein, squeezing 8 grams of it in each cup (1). You can cook quinoa in water, but swapping in bone broth offers an incredible boost in flavor (and nutrition!). StreetSmart Kitchen did this in her Easy Quinoa Salad, which would work great as a starter salad, or top with protein to make it the main event. This low carb side dish is packed with heavy cream and mozzarella cheese, making it taste like an indulgence. Full of healthy fats, it’s sure to please a crowd over the holidays or at any family gathering. And best of all? It takes just 30 minutes to prepare. Curry, carnitas, and cabbage rolls? Who would have thought your favorite dinner recipes could be made with chicken bone broth? You knew you could make chicken pot pie with chicken broth, but what about shepherd’s pie? This Traditional Irish Shepherd’s Pie by StreetSmart Kitchen is tasty, healthy, and meaty; it pairs well with ground turkey or ground beef. While surely you’ve tried chicken curry a time or two, have you ever tried salmon curry? In this recipe, Slim Palate combines fish sauce, fresh ginger, spices, chicken bone broth, and almond butter for a twist on panang curry. While it takes little-to-no prep time and only 10 minutes to cook, you would swear it was simmering all day. You can get your daily dose of chicken bone broth on Taco Tuesday. This recipe from Kim’s Cravings uses a slow cooker to combine boneless, skinless chicken breasts in chicken broth with red onion and spices. In six to eight hours, your carnitas are ready to be topped with guacamole, salsa, and fresh cilantro. Traditional Italian cabbage rolls are fun to enjoy, but time consuming. In this “unstuffed” version, Unbound Wellness skips all the unnecessary steps, choosing to prepare her cabbage rolls in one pot. Plus, she points out you can use either beef bone broth or chicken bone broth in this recipe. We couldn’t make this list without adding a section for soups and stews. But keep reading, as these recipes are fresh, inventive, and far from your grandma’s homemade chicken soup. Pressed for time? This wholesome, satisfying soup is tabletop ready in a total time of just 30 minutes. Plus, the meatballs are gluten free and dairy free, substituting cassava flour (almond flour will also work) in lieu of breadcrumbs and leaving cheese out entirely. It’s packed with amino acids, veggies, and greens, and is perfect for the whole family. If you love Mexican food but aren’t a fan of the calories, this Healthy Chicken Tortilla Soup is perfect for you. By combining fresh tortilla strips, fire-roasted tomatoes, cilantro, and shredded chicken, you get all the flavors you crave in one (healthy) bowl. If you don’t think your cooking skills are up to par, there’s hope: This soup is ridiculously easy to make. It requires just six ingredients and a blender to prepare. That Paleo Girl assures you this recipe is fool-proof, quick soup that anyone can make. If you like a thicker soup (think a bisque or stew) here’s a handy trick from Pretend It’s A Donut: To make your recipe gluten-free, simply sprinkle in arrowroot powder instead of flour. That’s exactly what she does in this Chicken and Mushroom Stew recipe, making a thick, rich stew base then topping it off with chicken, leeks, onions, and mushrooms. There’s nothing more satisfying than a thick, velvety soup when the leaves start to fall. However, most bisques, chowders, and other rich soups use heavy cream as a base — but not this one! In this recipe, Laurel Street Kitchen blends chicken bone broth with coconut milk and spinach for an extra layer of creaminess. While the name might sound a tad intense, this soup is incredibly easy to make. Josh of Slim Palate combines carrots, onions, chicken bone broth, coconut milk, and pork fat for a smooth, dreamy soup. Top with chicharrones (fried pork rinds) and kale chips for an added crunch. Looking for the easily the easiest recipe on this list? That would be this one, by Savory Lotus. Simply roast your vegetables and puree them with chicken bone broth and coconut milk. How easy is that? 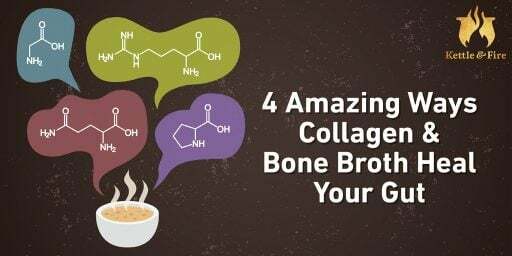 We really thought we knew every possible way to sip bone broth. Then Elana’s Pantry came out with this incredible (and very creative!) list of seven different ways to sip bone broth. We’re still trying a few of these ourselves! However you choose to consume bone broth — whether in a soup, main dish, salad, or straight from the mug — know that there is an unlimited number of ways to do so. There’s plenty of recipes on this site and online. New ones are constantly being added, so you’ll never get bored.